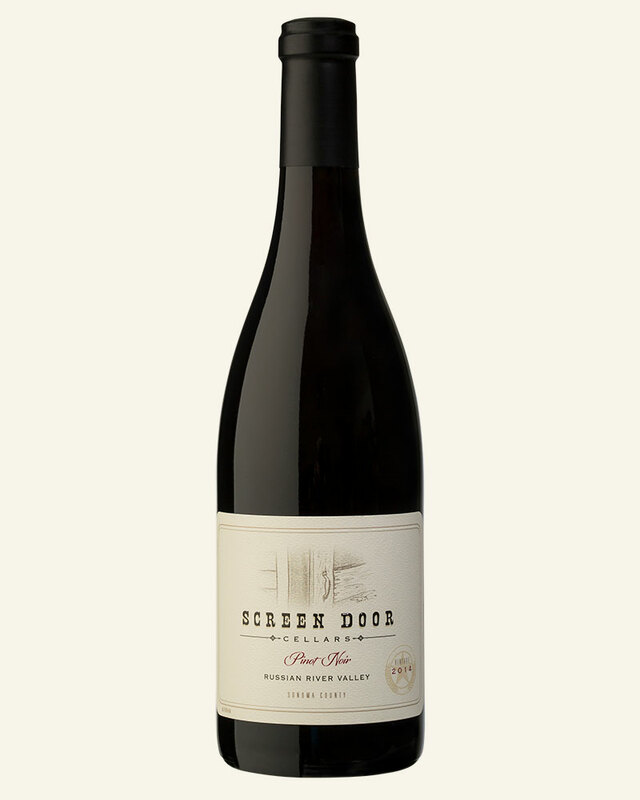 Screen Door Cellars creates small, handcrafted lots of ultra-premium Pinot Noir and Chardonnay by partnering with the finest growers in the Russian River Valley. This luxurious Pinot Noir explodes with strawberry, blueberry, clove, and vanilla cherry cola. The oak is well integrated giving lift to the fresh fruits and a smooth richness. Flavors in the glass follow to the palate with rich strawberry jam and nutmeg spice surrounded by rhubarb and white pepper. Profuse aromas of dark cherry and raspberry mingling with spices of sage, white pepper, and a hint of vanilla dance in the glass. An abundance of black cherry and cola flavors are accented with a back note of charcuterie and oak influences. Smooth in the mouth with immersed tannins and a the familiar earthy, dust that the Leras Vineyards is known for. Dark, rich, garnet colors flow from the bottle while flavors of black cherry and strawberry jam reach out from the glass with subtle hints of mushroom and clove. The smooth, rich palate is well balanced with deep fruit and oak with a touch of allspice and nutmeg. This wine is very well balanced between fruit and oak flavors. The 2013 Pinot Noir was harvested from the Leras vineyard in the heart of the Russian River Valley. The wine is complex and elegant with aromas of red raspberry, bright cranberry and strawberry intermingled with spicy undertones and a hint of anise on the back palate. It has smooth, silky tannins with bright acidity and a balanced finish. The 2014 Russian River Valley Pinot Noir opens with a dark ruby red color in the glass that leads to a inviting aroma of dark cherry, vanilla bean, plum, cola nut, strawberry, rhubarb and pomegranate. On the palate are flavors of allspice, cinnamon stick, and black cherry that intertwine with hints of truffle, earth and vanilla. A lovely, bright acidity is perfectly balanced by velvety tannins leading to a long finish. Moderately dark garnet color in the glass. Terrific nose with profuse aromas of dark cherry, raspberry, sage, white pepper, and a hint of vanilla. An abundance of black cherry and cola flavors are accented with a back note of charcuterie and oak vanillin. Smooth in the mouth with immersed tannis and a charitable finish. The 2015 Russian River Pinot Noir displays a cool climate vibrancy, a mellow finish, and impeccable balance. A stunning with that offers everything you look for in Pinot Noir. Moderately dark garnet color in the glass and profuse aromas of dark cherry and raspberry mingling with spices of sage, white pepper, and a hint of vanilla. An abundance of black cherry and cola flavors are accented with a back note of charcuterie and oak influences. Smooth in the mouth with immersed tannins and a the familiar earthy, dust that the Leras Vineyards is known for.